The first minute of this newsreel contains vintage eastern Skeeter footage with some innovative camera shots. The absence of springboards dates it to the late 1940s and early 50s. The narrator declared that iceboating’s “time of glory and past is forgotten.” Seems like that’s been declared for years but yet here we still are. 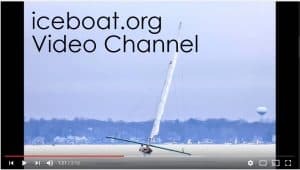 I came across this video on the Minnesota iceboating website where it was posted by John Bushey.